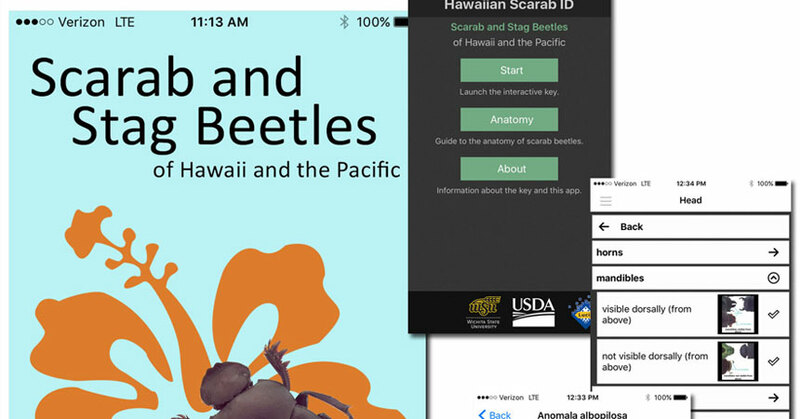 The USDA APHIS ITP team is pleased to announce the latest addition to our mobile app collection: Hawaiian Scarab ID: Scarab and Stag Beetles of Hawaii and the Pacific. Developed in cooperation with Wichita State University and Australia’s Identic team, this app is based on ITP’s recently released web-based tool, Hawaiian Scarab ID. Lucid Mobile apps offer you the identification keys you’ve come to rely on from the convenience of your smartphone or tablet. The Hawaiian Scarab ID Lucid Mobile app (free for Android or iOS) allows you to take your Lucid key with you into the field for surveys and screening, even if your field site lacks internet access. This key allows both specialists and novices to easily identify adult scarab beetles that occur or may occur in Hawaii, Guam, and the Pacific, including native scarabs, established pest species, and potential new invasive scarab species. You can help confirm whether you have found the correct species by comparing your specimen with the images and descriptions on the fact sheets, which are included for each species. The app also includes anatomy guides to assist novice coleopterists with important beetle features.